Compared to him , you have a WOMAN'S chin! "I know I'm only a bluff old cove with no legs and a beard you could lose a badger in..."
— Captain Redbeard Rum, Blackadder II. Men of the maritime or naval business, especially the more experienced ones, will usually grow beards. It's more an issue of practicality- shaving requires fresh water, and you have to conserve this on a ship. But in any case it is one way to tell that a character is a real Father Neptune. For Pirate Captains, a prominent beard is such an obligatory part of the dress code that you have a high probability of being named after it. Real Life gave us Blackbeard and Redbeard , and fiction has responded with Redbeard Rum (see right), Whitebeard, Yellowbeard, Purplebeard... everything but Bluebeard, which was already taken by a non-pirate. Any character sporting this is likely to Talk Like a Pirate. Something about the way the densely packed follicles baffle the sound waves... Combine with Beard of Barbarism for Pirates and Horny Vikings. Compare Sailor's Ponytail. Despite what it says in the trope's description, there was a Weetabix advert which featured "Black-, Blue-, Red- and Yellowbeard". All were afraid of the pirate captain of the Marie Celeste, who was in turn scared off by learning the Royal Navy had their Weetabix. Captain Smudge from Serendipity the Pink Dragon has a big grey beard like this, and talks like a pirate too. Despite mostly serving in space, Captain Okita of the Space Battleship Yamato wears the traditional bushy captain beard. Due to the franchise's roots as an intended parody of the SF anime cliches of the 70s, most Macross series traditionally have the captains of their respective Cool Ships to wear the traditional bushy beards. Bruno Global and Jeffrey Wilder being the most prominent examples. Max Jenius, though, is an aversion — he's clean-shaven and impeccably clad in white, and wears a Cool Shades just to show off what an Ace he is. He even looks like a total Bishōnen at 52. Shoji Kawamori reportedly outright stated that Max stopped aging due to his sheer awesomeness. One Piece runs on this trope. Captain Haddock in Tintin, and his old mate Captain Chester. Aquaman had one for a while. Lex O'Malley in Dan Dare. Most of the male pirates from Pirates of the Caribbean. 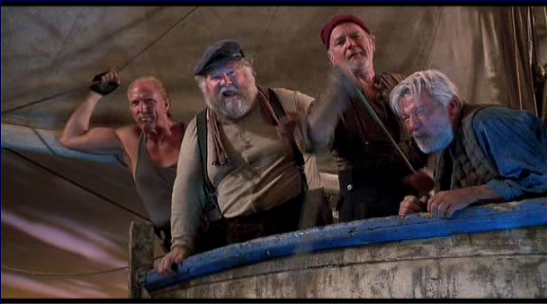 In Das Boot, most of the crew have beards by the end. Truth in Television, as fresh water was in limited supply aboard U-Boats. In The Final Countdown, several of the crew of the USS Nimitz wear a beard. Granted, this was 1980, so regulations have changed since then. Captain Ramius from The Hunt for Red October has an impressive beard. So does the nameless chief on his boat. While not strictly speaking sea dogs, many of the Sky Pirates in The Edge Chronicles have beards of this nature, especially Tem Barkwater. Now wherefore stopp'st thou me?. Surprisingly not prominent in Honor Harrington, Aivars Terekhov is one of those few who have it. Invoked in Going Postal, where Reacher Gilt affects an ostentatious pirate "look" including a beard. Mostly so that he can lose it when it's time to disappear. Redwall: Several shrews, otters and searats (all sailor-types, though only searats practice piracy) are noted to have beards. The page quote and image are of Redbeard Rum from Blackadder. He's ultimately eaten by cannibals, and all his comrades manage to save is his beard. Only Fools and Horses gives another Brit Com example with Uncle Albert. Commander Wil Riker famously grew a beard in Star Trek: The Next Generation. There is a popular German folk song called "Alle, die mit uns auf Kaperfahrt fahren". The Lyrics are "Alle, die mit uns auf Kaperfahrt fahren müssen Männer mit Bärten sein" (All who go on a sea raid with us have to be men with beards). Bluto/Brutus in Popeye has this overlapping with Beard of Evil. Popeye himself is eerily hairless, while his father, Poopdeck Pappy, has thick Perma-Stubble. Capt. Price in Call of Duty: Modern Warfare 2. When you first see him he looks like a crusty old sea captain. Captain Daitetsu of Super Robot Wars Original Generation is the very model of the old salty captain, with beard and pipe. Captain Ed Shivers from TimeSplitters: Future Perfect. Zigo dAcosta of BioShock 2's multiplayer. Gangplank from League of Legends. Kunkka from Dota 2, an Admiral with a pirate-y outfit who uses lots of gratuitous nautical lingo. In Burly Men At Sea, the three seafaring Beard Brothers, and the mysterious old man at the coffee shop who is probably a retired sailor, all have enormous beards. Captain McCallister of The Simpsons fits this to an extent given his nautical work, Verbal Tic of "yar", and roughed up beard. Yellowtail from Steven Universe has a large, bushy beard, befitting his job as a fisherman. Lampshaded in The Pirates! In an Adventure with Scientists!, as the Pirate Captain is very proud of his bushy beard, and it's even one of the judging points of the Pirate of the Year Award. His rival, Black Bellamy, has a bigger beard, which makes the Pirate Captain feel inadequate. Eerie Cuties has ghost pirate Jim Beard Sprynter as a phys.ed. coach in Charybdis Heights. Girl Genius: The British Admiral who welcomes Captain Hawkins and her surviving crew back to England has an impressive beard. As mentioned above, it was largely Enforced Trope in time of Wooden Ships and Iron Men and even into the later 19th/early 20th century for most seamen (at least while at sea) - shaving without freshwater was next to impossible, and most of the limited supply of freshwater carried by ships of the era was necessary for drinking and cooking. This condition existed even longer on smaller naval vessels (not equipped with dedicated freshwater condensators), such as destroyers and especially submarines. In the Royal Navy, you can have a beard and moustache, or be clean shaven. That's all the choice you have. Prince Philip grew an impressive beard while serving at sea during World War II. Then-Princess Elizabeth kept a photo of the bearded Philip in her room because their courtship had to be kept secret and he looked like an entirely different person from his normally clean-shaven look. The US Navy actually prohibits beards among sailors- due to the need to get a gas mask on. Beards were a bit of a naval tradition in the Royal Navy, and in the US Navy (since the latter was pretty much based on the former). During Zumwalt's term as the American Chief of Naval Operations, beards were re-authorized for American Navy personnel, though they've been banned since. This rule does not appear to stop certain SEALs . It's fairly common for commanders of special forces units to turn a blind eye to shaving regulations. It's almost an unspoken rule that they've "earned the right" due to the particularly grueling and dangerous work they do. It also helps them do their job in places like Afghanistan, where most men have beards. Beards are considered an essential sign of masculinity in Afghan culture and many Afghans won't take a clean-shaven man seriously. They also aren't breaking any rules. Spec Ops personnel (and those working with them) are given "grooming waivers." Other personnel with skin issues can be issued "No Shave Chits" which, well, allow the bearer to not shave. Many US submarines allow the beards while underway. Traditionally, a sailor buys a $5 No Shave Chit, which goes into the ship's recreation fund. However, as soon as the ship pulls into port or if there are riders aboard, then they're immediately required to shave. Edward Teach had such an ominous beard that he's better known as Blackbeard. During World War II, the Kriegsmarine took pride in not shaving, as they considered it a waste of resources. Even nowadays, German sailors on subs tend to eschew washing and shaving. But yes, with limited freshwater resources, this is justified.